As a colony of England and English rule, Connecticut originally did not have any rights to govern themselves or even to make local laws. In 1662, King Charles II wrote a charter granting Connecticut the right to elect local leaders and even to create laws. The “Connecticut Charter” became an issue when King Charles II died and his brother, James II became the next king. James II didn’t want the Connecticut colony to have that much autonomy, so in 1667 he sent an ambassador, Sir Edmond Andros, to recall the charter. During an interesting turn of events, in which colonist leaders and Andros met to debate the charter, the candles in the room suddenly went out. When order was restored, the charter, which had been on the table between the parties, was missing. It had been hidden in the trunk of a white oak tree so that it would be safe from Andros. The Charter Oak became a symbol of American independence. Today, the image of the Charter Oak is commemorated on the Connecticut state quarter. How would you protect your freedoms? How were the beginnings of a national identity created by colonies with very different purposes and varied governmental and economic systems? 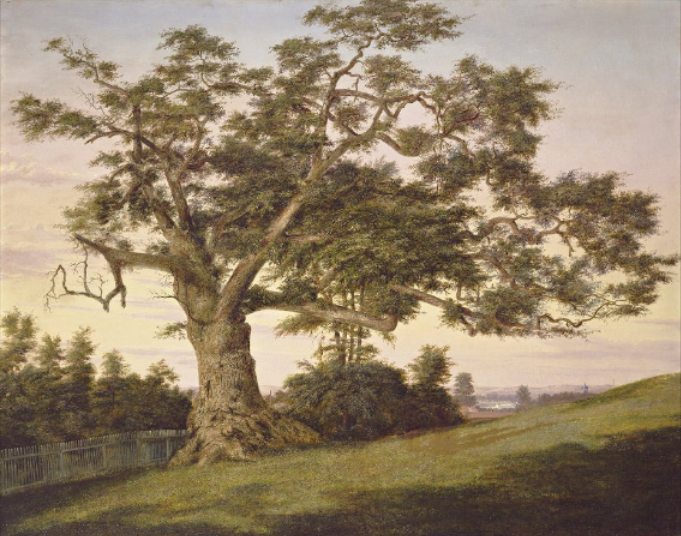 Charles De Wolf Brownell, View of the Charter Oak, Hartford, oil on canvas – The Wadsworth Atheneum. The legend of the Charter Oak is the story of our independence. Have students generate questions, in small groups, to reflect on this statement. Narrow the list down to closed questions (ones that have a definite answer) and open questions (inquiry). Have students chose one or two to research. How might the history of the United States have turned out if the charter had not been taken? Why did James II decide to take the charter back after his brother, Charles II, had issued it to the colonies? Have students take the sides of the colonists and the English ambassadors and create a reenactment of the events. What would have been discussed? What would have happened if the ambassadors had taken the charter? The Connecticut state flag does not contain the Charter Oak. Create a new design for the state flag that would include this iconic image. At the corner of today’s Charter Oak Avenue and Charter Oak Place in Hartford, the Charter Oak Monument marks the location of the legendary Charter Oak tree. Visit Connecticut’s Old State House or the “Liberties and Legend” exhibit at the Connecticut State Library’s Museum of Connecticut History. HartfordHistory.net: What is the Charter Oak?